An estuary is a pretty interesting place. It is where the ocean meets the rivers, creating brackish water (when salt water mixes with fresh water). The estuary is home to a lot of marine animals and birds. Many of these organisms, including most commercially-important species of fish, depend on estuaries at some point during their development for a place to live, feed, and reproduce. Estuaries are often called the "nurseries of the sea” because many species of fish and wildlife rely on the sheltered waters of estuaries as protected spawning places. Because they are biologically productive, estuaries also provide ideal areas for migratory birds to rest and re-fuel during their long journeys. Many different habitat types are found in and around estuaries, including shallow open waters, freshwater and salt marshes, swamps, sandy beaches, mud and sand flats, rocky shores, oyster reefs, mangrove forests, river deltas, tidal pools, and seagrasses. The Great Bay Estuary in New Hampshire is one of the largest estuaries in the U.S. Atlantic Coast, encompassing over 25,000 acres of tidal waters and uplands. Even though New Hampshire has the shortest coastline of any state, those 18 miles increase to 150 miles of tidal shoreline when the Great Bay Estuary is included. 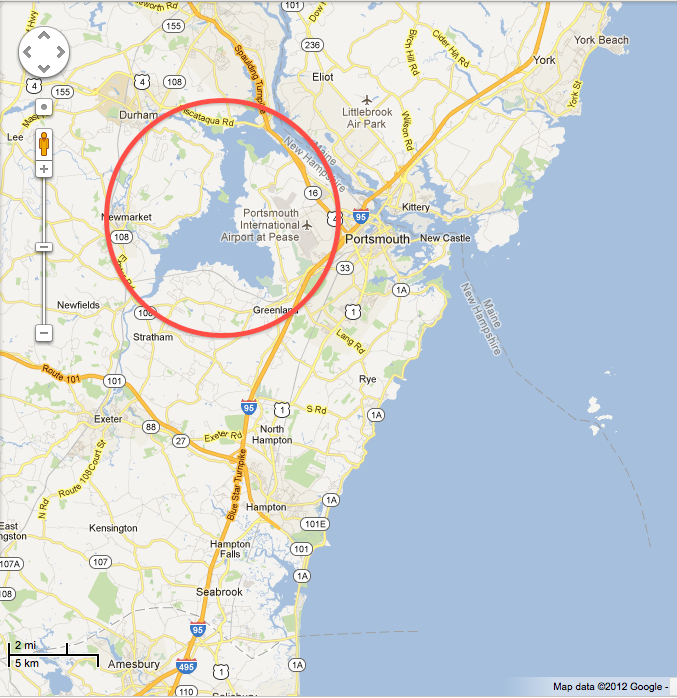 Being 10 miles inland, Great Bay is also recessed or “tucked away” from the ocean. And my study animal exists in this estuary. New Hampshire and Great Bay is at the most northern range of the American horseshoe crab (Limulus polyphemus), making this region’s horseshoe crab pretty appealing to study. Interestingly, it is a rare case to see a live juvenile horseshoe crab in this estuary. We see the adults all the time during the early summer (their mating season) when they come up to shallower waters to pair up, dig nests, and lay eggs, but there have been no reported cases of live juvenile horseshoe crabs ever been seen. So where are they? If we’re able to find the adults and their nests, why aren’t we able to find juveniles? This is where I come in. One of the goals of my research is to find where juvenile horseshoe crabs are located in the Great Bay Estuary. So how do I do this? Well, one method that a lot of field science (in particular marine science) gets done is through SCUBA diving. “What is it like to SCUBA dive?” is a question I get asked a lot. At first diving is a little scary; your connection to the "breathable" world is out of your reach and your only source of air is a tank on your back. But you enter a world that is almost foreign; what you normally see in aquariums, movies, and TV, you can experience with all your senses and it’s an exhilarating and exciting feeling. Diving in the ocean is very different from diving within an estuary. A lot of my friends and colleagues aren’t particularly fond of diving in the estuary. So what is it like to dive in the estuary? Well, it’s still an exhilarating feeling of entering a foreign world, but visibility is limited. Because of its extensive and shallow mudflats and extreme currents, it is hard to gain a sense of direction. You feel like you’re swimming through chocolate milk. I don’t recommend new divers diving under these conditions as you can become disoriented quickly. I am amazed that animals like a horseshoe crab can grow up in such a habitat. A mudflat, lifeless at first glance, presents so many challenges, like hidden predators, limited visibility, strong currents, and a potential lack of food. It makes me appreciate them and all marine animals a lot more. Learn more about Great Bay Estuary by visiting the Great Bay National Research Reserve.